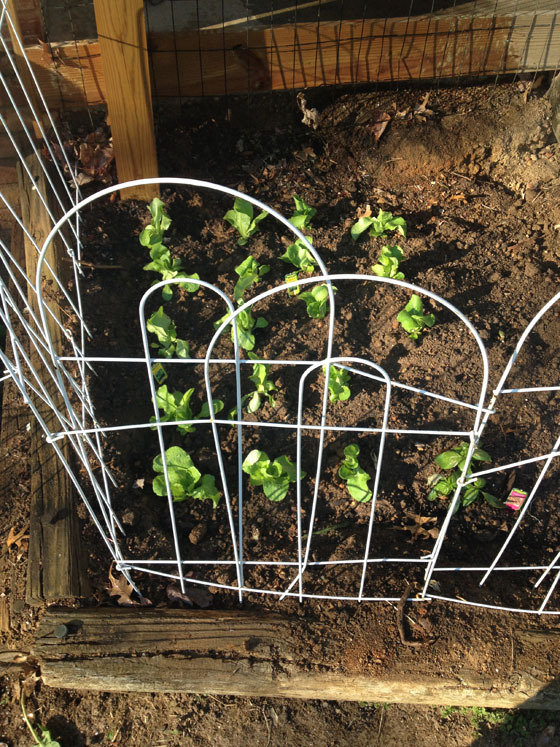 Those of you who read my blog regularly know that I absolutely love to garden. I started my own garden with my dad’s help my junior year of college in the front yard of our rental home and I’ve been hooked ever since. My friends and family know how much I love it. My neighbors even call me Farmer Jess! Did I mentioned that my maiden name means “farmer” in German!? This weekend was pretty much non-stop yard work and gardening. Brian and I started to tackle a huge project behind our fence, removing all of the branches, bushes, leave, etc., that we’d thrown back there the past two years and shredding it all in the wood chipper. We spent Saturday morning and Sunday afternoon and are about 2/3 the way complete. It looks so much better and our neighbors behind us even came out to say thank you and to introduce themselves! I found three snakes, all of which I tried to save from accidentally being raked and wood chipped But who cares anymore about yard work! I want to talk about my garden!!!!! I went to Home Depot after Easter brunch yesterday and picked up some perennials for our front yard. I also got some pink begonias for the front of the house. But most important, I bought veggies, and lots of them. In my excitement to start my vegetable garden I didn’t think too much about quantity… so I went overboard just a little. I bought 18 heads of romaine, 18 heads of spinach and 18 heads of butter crunch lettuce. Holy smokes, that is A LOT of lettuce. We are gonna be eating a lot of salads this summer. I also planted a ton of red and white onions! I’ve never planted onions before, so we’ll see how they do. I’m intrigued to find out just how you know when an onion is ready to be picked since they grow underground. The hubby is excited about the onions — OK, he isn’t actually excited because gardening isn’t his thing at all (although he does like to harvest with me. Of course, the most fun part! ), but he does loves onions. 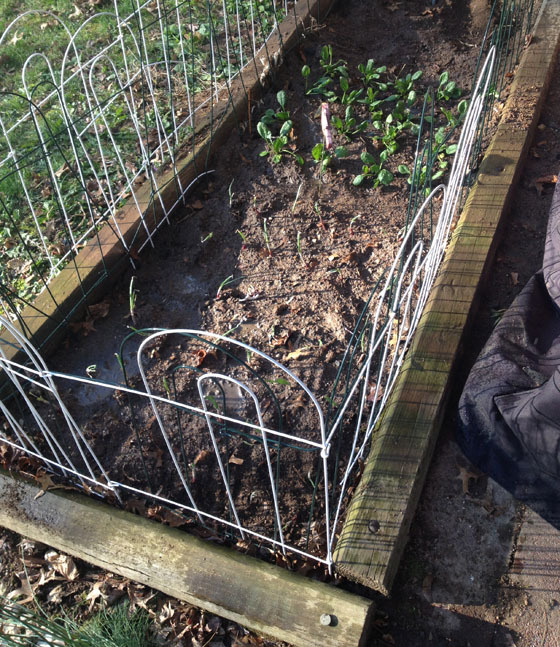 I doubled my gates around the beds with onions because my evil dog loves to 1. be in places he is not allowed to be, 2. dig — but only in dirt, not in grass, 3. be an all-around jerk in his yard. And onions are really bad for dogs. He was only interested in my garden last year when I was inside it and he was on the other side of the fence, so here’s hoping with two fences and no people inside them, he leaves the garden beds alone. I’ll have to do some onion monitoring this week to make sure he’s not sneaking in when we aren’t looking. The last thing I planted so far was herbs! 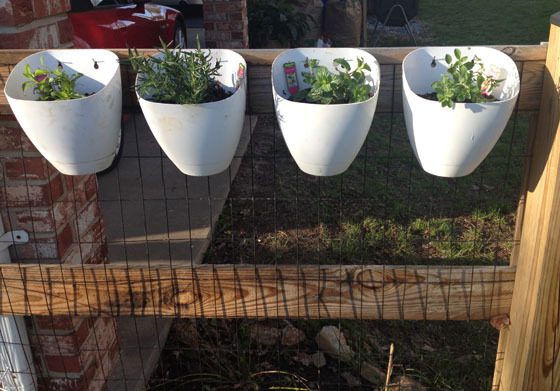 I planted oregano, tarragon, sweet basil, sweet mint and rosemary. I bought some hanging planters on clearance last year from Target, so I planted my herbs, then hung each planter on the fence. I love how this looks! I planted the basil with the lettuce since I plan on getting more of it later in the season. I am pretty pumped that I already have a ton of stuff planted and that I used a bed I didn’t use last year and the space where an old stump used to be, so I’m hardly in any of the prime tomato panting territory! Woo! 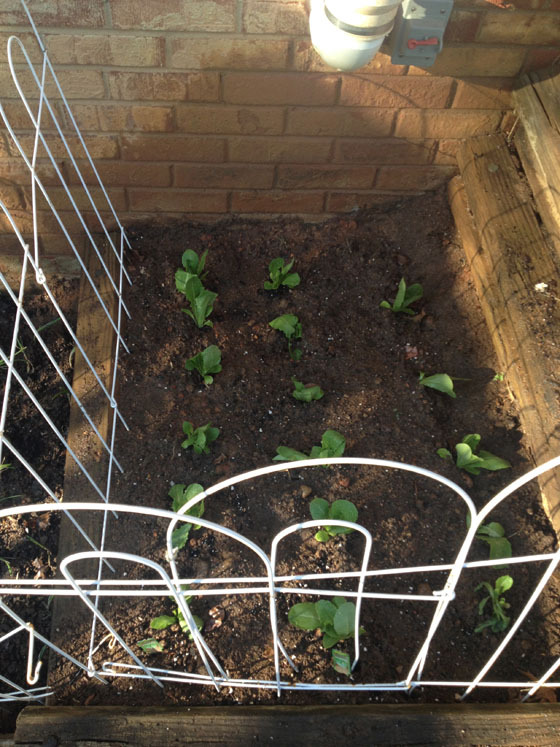 I’ll definitely be expanding my beds in the corner of my yard this year, too… when the time comes. My strawberries seem to be coming to life again, and the blueberry and raspberry bushes I planted last year… well, who knows how they did this winter. Yikes. 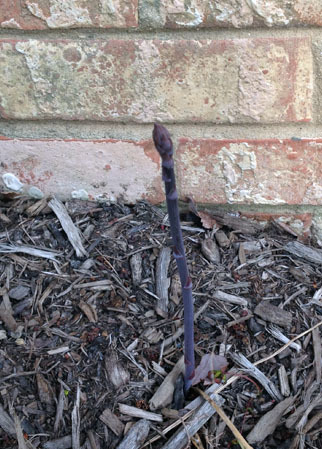 My last exciting garden news, and wow you will all think I am a huge dork, is that my asparagus that I planted two years ago sprouted!!!!! AHHHHH I was so excited I ran to find Brian to tell him. And then I called my dad 🙂 The funny thing is, there’s just one! 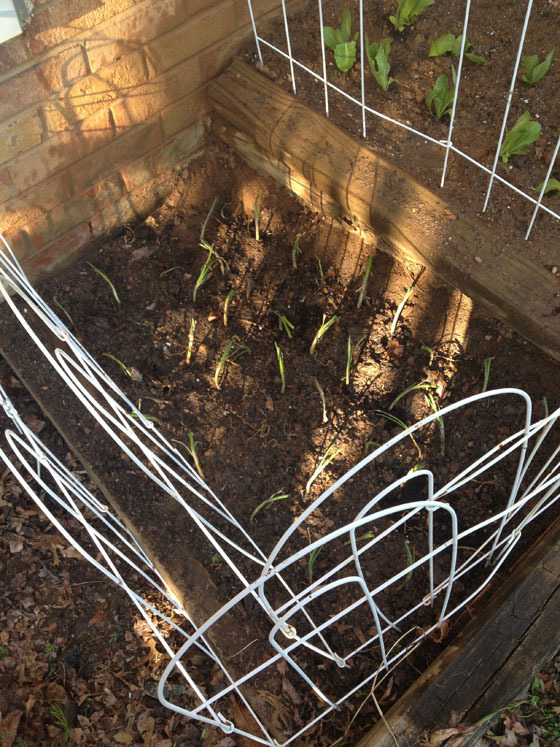 I don’t know if more will grow or not… but either way, I love my single asparagus and it is going to be deliciousssss. 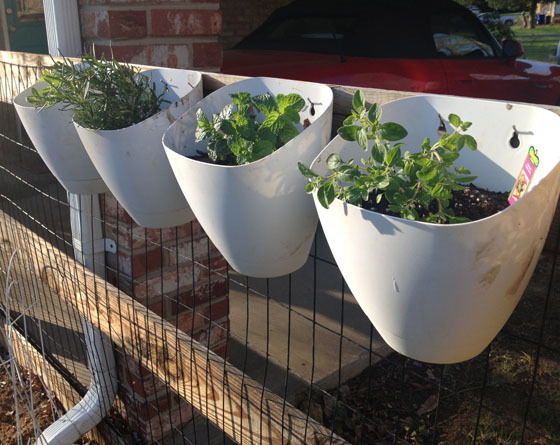 Anyone start their garden yet? If you did, what are you planting? I am thinking about planting broccoli in a planter on my deck this year. It always gets eaten in my garden, so if I don’t do a planter, I don’t want to plant it again. Too many worms. As for the rest of my garden, I’m thinking TONS of tomatoes, cucumbers, squash/zucchini, and lots of peppers. Now peppers — Brian is excited for those. Hopefully this year he isn’t foolish enough to bite into a cayenne pepper, seeds and all. Ouch. OMG OMG OMG OMG. A CRAFT POST. A CHRISTMAS CRAFT POST!!!!! Holy smokes, she’s back! Yup, this craft blogger has some crafts to show you! I mentioned a few posts back that I have ben focusing lately on getting healthy and losing weight — well, I am more than 30 lbs down (Thank goodness! Chubby me was tired of being chubby!) and feel like I have a much better grasp on the balance between eating, exercising and all other fun activities like CRAFTS! 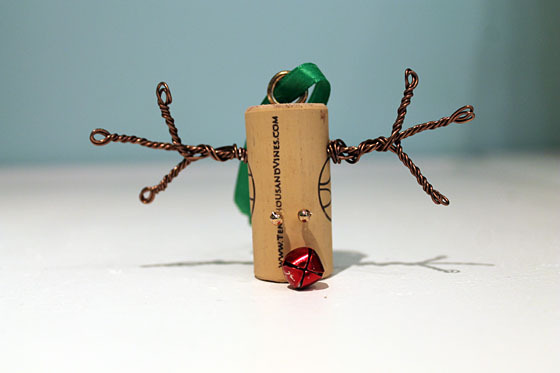 Enter Rudolph the wine cork reindeer! 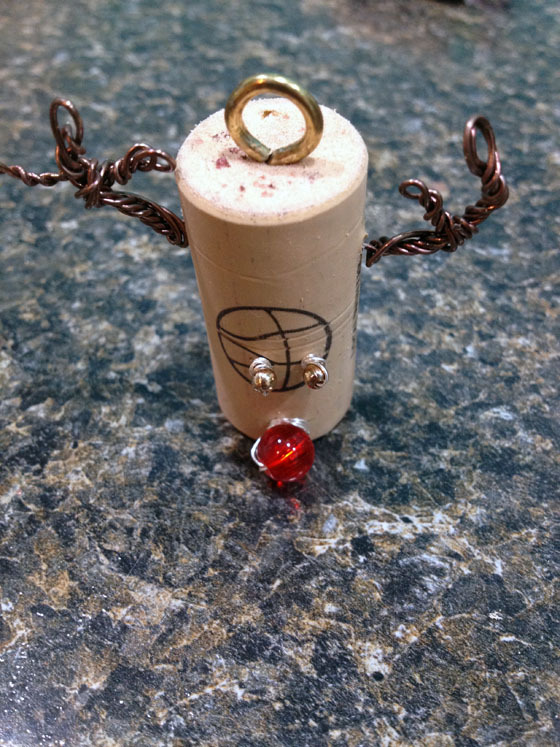 To make this freakin’ adorable ornament, first start with a cork. I like the corks that aren’t true corks. 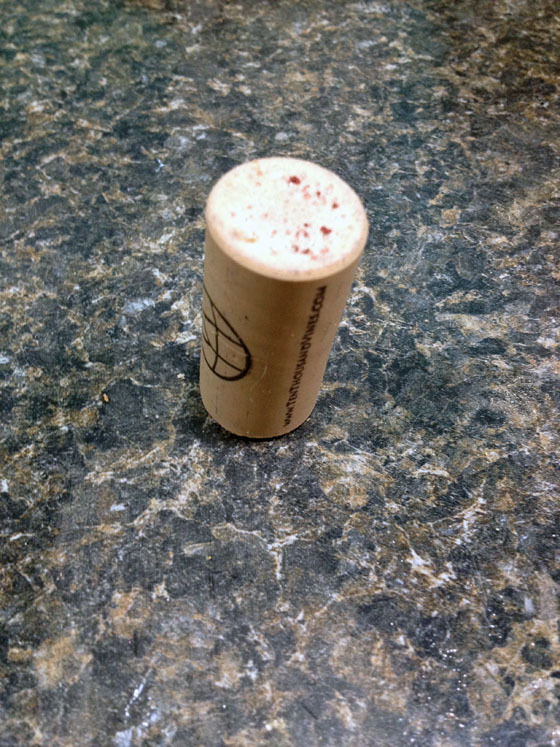 They have a layer of skin (almost) to them that makes this project easier than if you were to use a true cork. 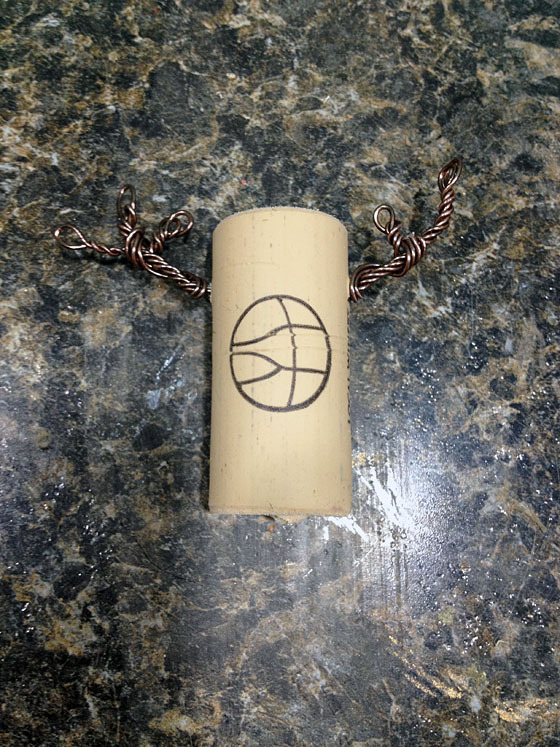 Drill through the cork — don’t go top to bottom, rather drill through the side of the cork, somewhat near the top. This will be the heigh of your antlers. Cut a long piece of malleable brown wire and fold it in half. 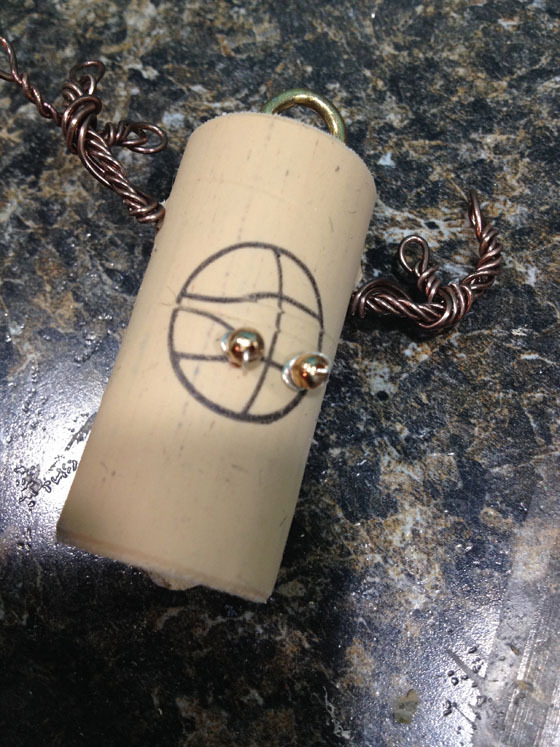 Stick the wire through your drilled hole, sending the folded end through the cork first. 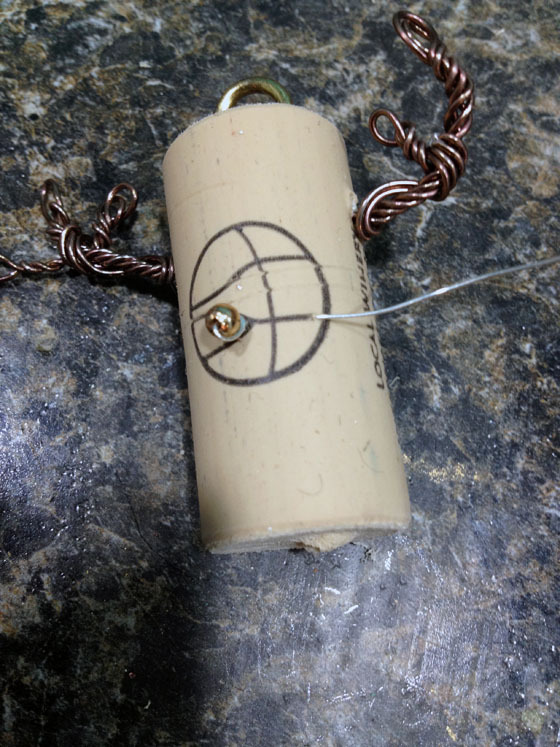 I learned the hard way that it is much more difficult to get your wire through your cork if the sharp end leads the way. 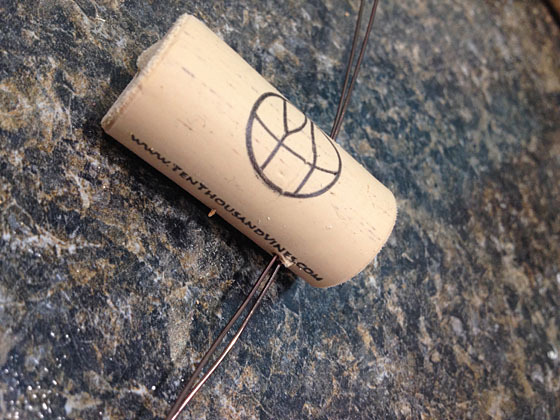 Your cork should sit in the middle of your wire. Next, it’s time to form your antlers. 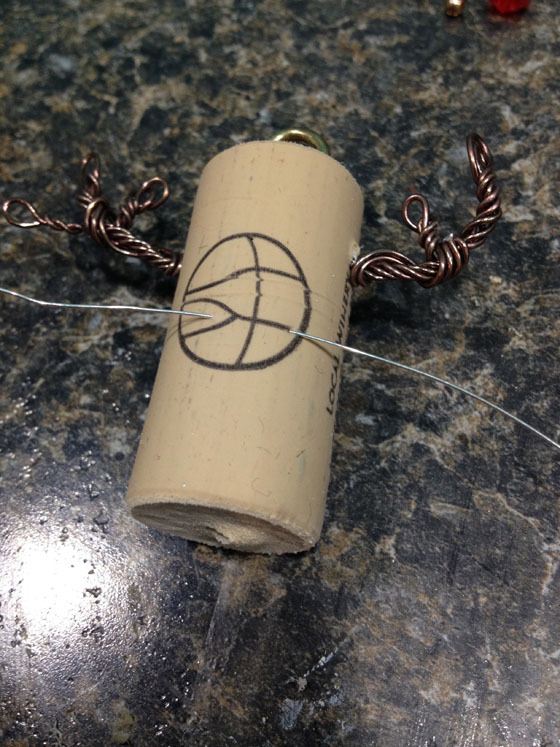 I folded the wire about 1.5 inches from the base and twisted the wire until it touched the cork. Then, with the extra wire I wrapped back up the twisted portion and did this again. I ended up with three-pronged antlers, with the extra wire wrapping down along the base of each. Do this on both sides. 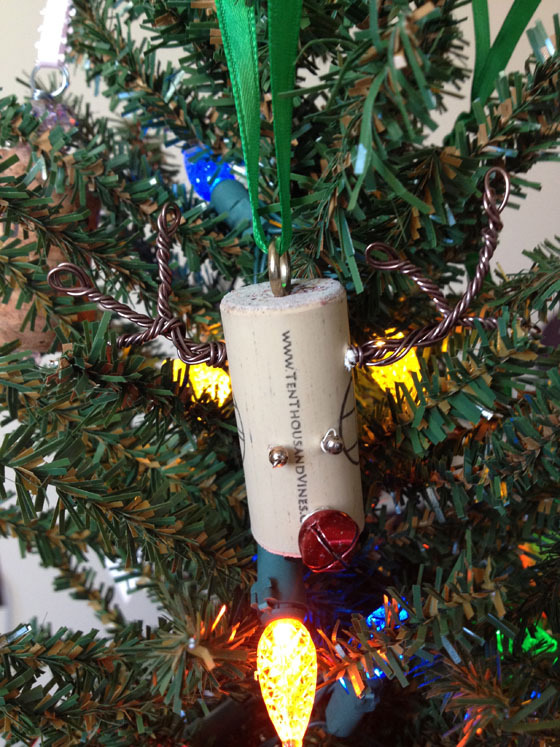 Once the antlers were on, I screwed an eye hook into the top of the cork to make this an ornament. Time for the eyes and nose! 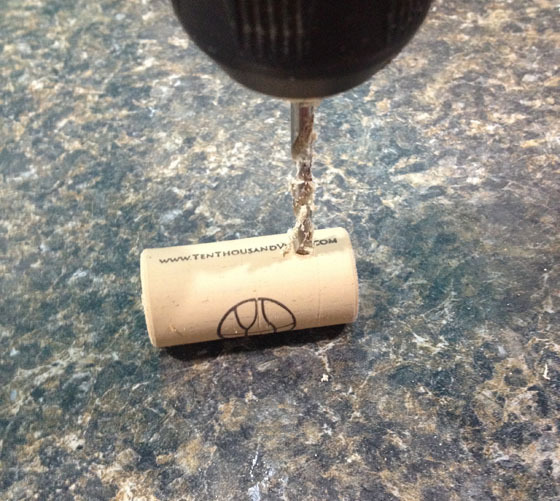 Here’s where your cork having “skin” is important. I took a nail and pressed it through the skin of the cork as an appropriate eye level for rudolph. It went in at one point and came out another — these entry/exit points are where the wire will enter and exit. Once you create your hole and feed your wire through, add see beads for eyes. 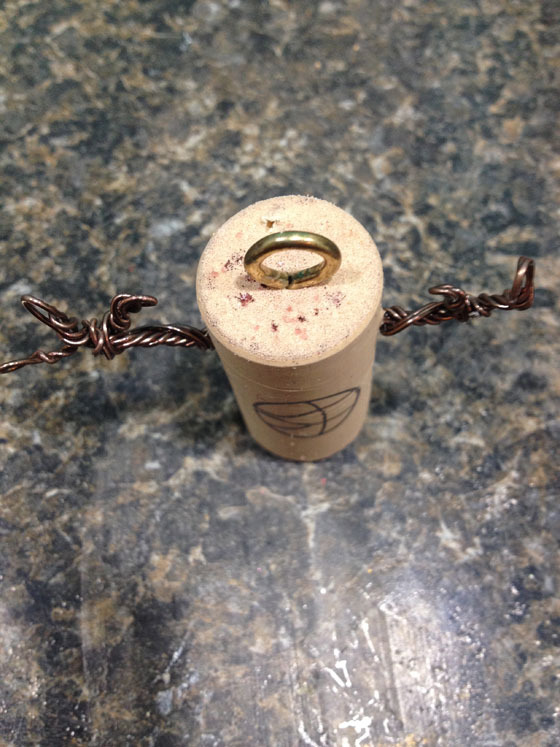 Get them as close to the cork as possible, then wrap wire around the base of each eye to secure them to the cork. I used this exact same process for the nose. I tried to make the entry and exit points closer together when feeding the nail through the cork since the nose didn’t need no be spaced far apart like the eyes. I used beads and bells on different ornaments, but each one needs to be secured to the cork by wrapping the wire around the base. The final step is to add a ribbon! Voila! 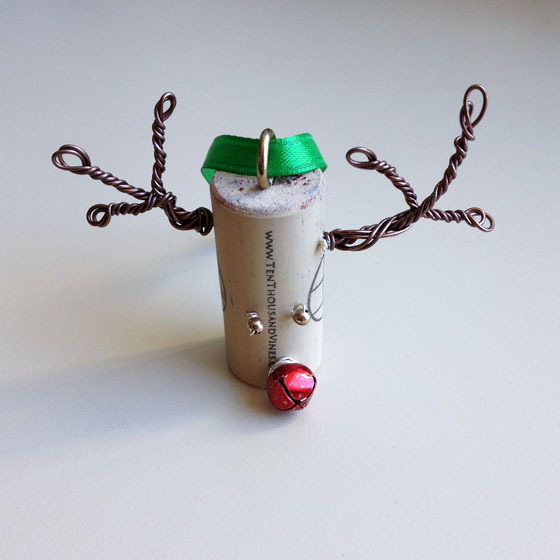 Rudolph the Red-Nosed Wine Cork! My sister is getting married! Look what we got in the mail this week. I love wedding invitations. They can be so creative and beautiful, and Allie’s truly is both. 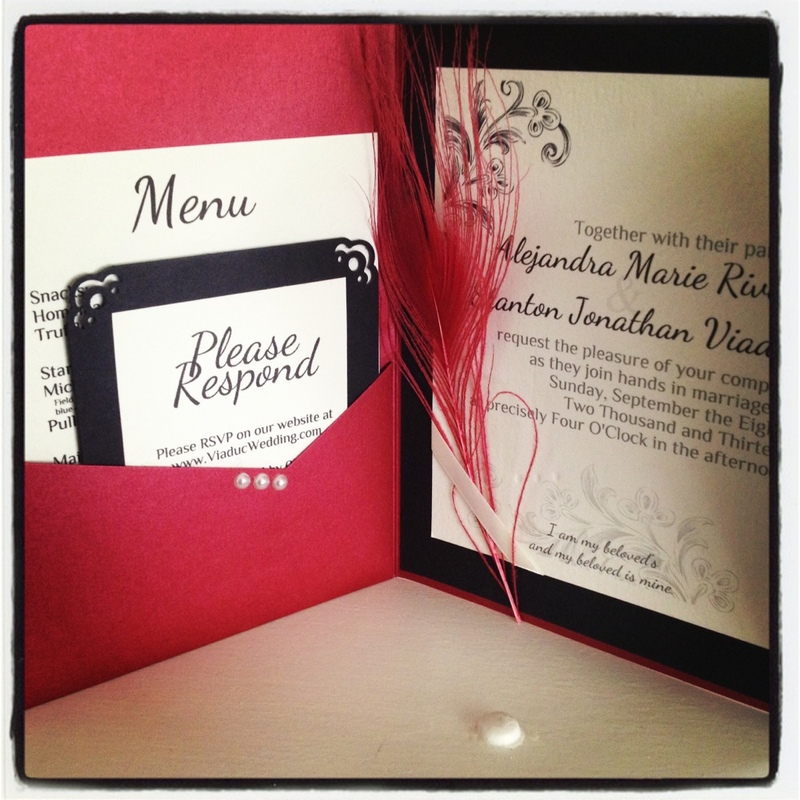 Love the red feather accent!! !